Powerbyproxi was excited to get these leads through Inventables Marketplace! Fady Mishriki from PowerbyProxi says "Inventables innovation push methodology is simply, clear and effective, and the new online marketplace a great tool for innovative companies wanting to showcase their technologies to the world. They spent the time getting to know our technology and then pointed us in the right direction, we are now exploring a number of exciting opportunities as a result." When this pressure sensing sheet is connected to an electrical circuit, it has an electrical resistance. As you apply pressure on the sensor, its resistance decreases. This researcher has built some very sophisticated robots that makes use of the technology. The robots have high speed robot hands that can perform impressive acts of dextirity like bouncing a ball, tying a knot, and using a tweezers to pick up a pill. One of our motivations for launching the new Inventables Marketplace was to end cold calls. In our view cold calls are ruining the world. We hope our new website puts an end to cold calls. The reason we think cold calls are bad is they interrupt productive work. Most engineers that work in product development wish they had more time to work on designing their product. They often find themselves in back to back to back meetings and when they finally get back to their desk the phone starts ringing. 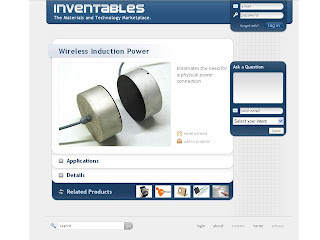 We hope that Inventables Marketplace will be so effective at connecting vendors with new customers they will spend time educating the world about their products by creating and updating product profiles like this one for Overmolding with Plasma Treatment rather than cold calling prospective customers and interrupting their work. Today we released a new product profile design to the world! We launched the Inventables Marketplace to give vendors leads worth their time. We hope the new design will get out of the way and make it easier for qualified buyers to connect with vendors. Built into the new design is an editing feature to make it easier for Vendors to create and update their product profiles. Keep your eyes on the site because we have a number of new features coming soon that we can't talk about yet. It might sound like the stuff of secret agents, but magnetic ink, electronic paper, water-soluble glass and translucent concrete could be just what Sligo businesses need to make their product sell. IT Sligo is the first centre in Ireland to hold an Inventables.com technology and materials licence. What it means is that businesses which are looking for a specific material to make a product work or solve an engineering challenge can now sort through thousands of patented materials to find the right one. We're very excited to be working with the Centre for Design Innovation, at the Business Innovation Centre in Institute of Technology, Sligo. Mixed martial arts, and specifically the UFC, is taking the United States by storm. A former High School wrestler, Craig Diamond, started a fight short company called Diamond MMA. Craig joined Inventables as a Buyer in 2009 and set out to design and produce a line of branded MMA apparel that would incorporate a classic look and turn-of-the-century toughness. While the first step was to build a stable of proprietary designs, the next step is to engineer a fight short that would improve a fighter’s performance and revolutionize its niche in the MMA apparel industry. We'll be following his progress as he uses Inventables online marketplace as an R&D department to help source materials and technologies for these revolutionary shorts. Inventables new online marketplace makes it easy for vendors to get leads worth their time. It's free to get started you simply create an online profile for each product. Leads from within the Inventables paid buyer network are free and vendors can choose to purchase additional leads that are interested in their products. This new movie explains how the process works. We're very excited that Inventables materials are now open for the world to review. We made the decision to open the marketplace because we think it will advance our mission to make sourcing and selling materials and technologies easier than the status quo. We're working hard on the marketplace to make sure it's worth spending time using it for everyone in the Inventables community.